If you are in need of some new chairs for your home, this chic and modern Tyson dining chair from the Moe’s Home Collection is the perfect choice. With a sturdy, brushed stainless steel frame and a plush, comfortable polyurethane foam seat and back, this handsome chair will perfectly complement the décor of your house or apartment. Use it for dining or even use it for extra seating in the living room. Either way, you will receive many compliments have a beautiful addition to your home. Hello - this chair seems pretty sturdy - weight capacity? Also, does it have something under the chrome bottom's so it does not scratch the floor? 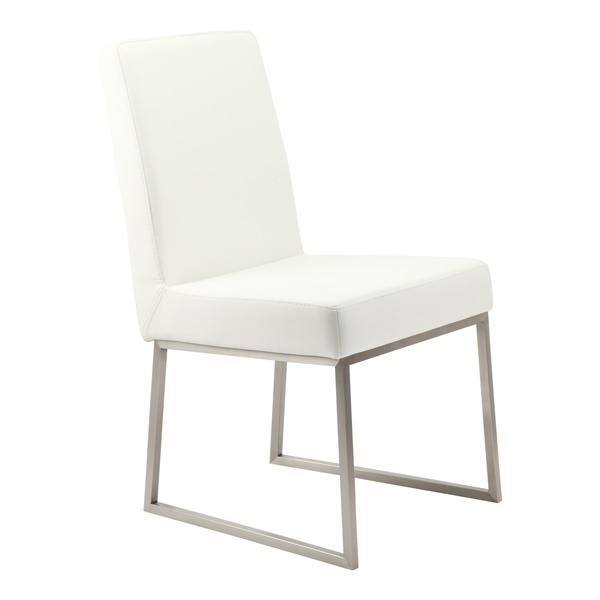 The weight capacity for the Tyson Dining Chair is 250 lbs. The underside of the legs have glides / floor protectors to prevent scratching the floor.